Slow cooker liners: to line or not to line? I think it was an impulse buy on dh’s part, when he was at Bed, Bath & Beyond prior to Christmas. He found a package of slow cooker liners and, knowing my luuuurrve of the crock pot, decided to buy me some. A few weeks later, now that the crock pot is up and humming a few times a week, I decided to bust one out and see how they work. Many recipes don’t need a liner – you can clean up most crocks easily enough, especially if you sprayed them with Pam or some other non-stick cooking spray prior to loading them up. It’s the recipes where things cake or harden or crust on bottom or the sides where you feel like you’re going to give yourself a repetitive stress injury (RSI) trying to clean the crock after dinner. Inspired to make a Mexican Meatloaf, I thought this was a perfect time to try out the liner. 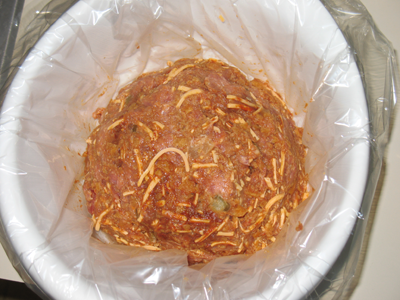 After all, meatloaf in the crock pot is tasty, but it can be a complete PAIN to clean up. More than once, the crock has had to soak for quite a while before we can manage to get it clean. Opening up the package, I was disturbed to find that the liner was wider than it was tall. 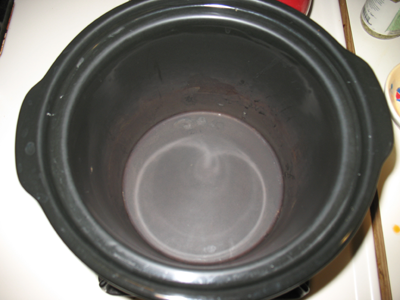 While I know that these liners were designed to fit all crock pots – oval or round – this was a dish to go into our round 4qt crock pot, and I was worried that the liner wouldn’t reach all the way to the top. What then? Turns out, my fears were unfounded – there was plenty of excess to slop over the top. Better still, moving the crock to the stove allowed me to move the entire liner to the cutting board in one quick trip. The amount of moisture in the liner was what I would’ve expected, and (as I’ll discuss when I post the recipe), there was ZERO departure from the usual moisture level by using the liner – meaning the liner had no impact on the quality of the outcome. And, the icing on this cake was finding that my crock was BONE DRY when I removed the bag. There was ZERO leakage. Of course, removing the meatloaf from the bag wasn’t a completely easy task; it’s not like you can flip over a meatloaf when there’s glaze on top and a small amount of grease in the bag. I siphoned the (really incredibly small) amount of grease that accumulated in the bag with a bulb baster and then trimmed the bag with kitchen shears. I was then able to use a thick pancake turner to remove the meatloaf. Sure, some of the meatloaf stayed with the bag – but no more so than we’d lose to the bottom of the crock pot during a non-lined cooking…and this time, there was no scrubbing involved! The 4qt round crock, just after the liner was removed - DRY AS A BONE! Now, I know that these things aren’t cheap. From what I’ve heard, it sounds like they typically run about $1 per liner. And, as I mentioned above, in many cases, they’re just not necessary. Still, if you have a hard-to-clean dish, there’s no reason NOT to use one unless you have an anti-plastic/environmental concern (at which point you could also argue about the extra water and detergent that are required to scrub off the inside of the crock…at least a break-even situation). I wouldn’t recommend them for everyday crock pot action, since I think that’s overkill, but if you have an RSI or if you have one of those tough dishes, no need to struggle now that technology has been invented to solve the problem for you. As someone with tendonitis in both arms (from typing), washing dishes for ages and vigorous scrubbing can be really hard on my hands and arms. So, for the cases where I know these will come in handy, I’ll definitely use them. I highly recommend picking up even a small package and giving them a try – for the time-crunched, every little bit helps! 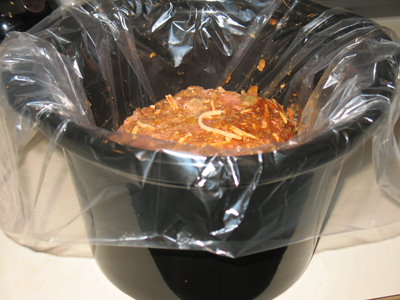 This entry was posted in crock pot cooking and tagged balance, crock pot, crockpot by crunchymetromom. Bookmark the permalink. Thank you for the review! I might have to finally try these liners out some day.